The 2006 United Nations Secretary-General’s World Report on Violence against Children indicates that violence against children, including child sexual abuse and severe physical violence, is a challenge in many countries. Lao People’s Democratic Republic (PDR) is no exception. This violence cuts across boundaries of age, geography, religion, ethnicity and income. It also takes a multitude of forms, which are often rooted in social, cultural and economic practices. Particularly in Lao PDR, social norms generally purport the belief that violence against children in the home is a private affair and that physical violence is an acceptable way to discipline and educate a child. For example, 42 percent of Lao adults believe physical punishment is necessary to properly raise a child. Furthermore, children are reluctant to report incidents of violence committed against them, sometimes in fear of retribution against themselves or family members, out of shame or guilt, or due to the belief that they merited such treatment or were in some way responsible. Violence against children affects children’s brain development and their ability to learn and can lead to a variety of behavioral and emotional issues. Children exposed to violence can experience severe short- and long-term health problems. When they reach adulthood they are at increased risk of developing heart disease, cancer, chronic lung disease, liver disease, stroke, diabetes, obesity, high blood pressure and overall poor health., . The stress of long-term violence can also lead to anxiety, which makes victims more vulnerable to depression, attempted suicide, and learning, attention and memory difficulties. Long-term violence can also lead to reduced school performance, including an increased likelihood of dropping out or repeating a year. Over the past few years, the Government of Lao PDR has increased its efforts to address all forms of violence against children. In May 2013 the Government adopted a National Plan of Action to Prevent and Combat Trafficking in Persons (2013-2015), an extension of which is currently under discussion. In March 2014, a National Plan of Action on the Prevention and Elimination of Violence against Women and Children (2014-2020) was also adopted, prohibiting for the first time all forms of violence against women and children (physical, sexual and emotional) in all settings. Furthermore, in December 2014 the government adopted the Law on Preventing and Combating Violence against Women and Children. However, enforcement and implementation of laws remains very inadequate due to limited human and financial resources and insufficient dissemination and capacity building activities to enhance awareness, knowledge and understanding of new legal provisions among professionals and communities. This shortcoming is accompanied by a limited number of services by both government and NGOs/civil society organizations — there are very few qualified social workers in the country with the capacity to identify and safely reintegrate children at risk of or victims of violence, exploitation and abuse. To set the stage for a broader and longer-term social mobilization and behavior change initiative to reduce violence against children, UNICEF, in collaboration with the National Commission for Mothers and Children and the Ministry of Information, Culture and Tourism developed a logo to represent the #ENDViolence against children initiative. A range of communication materials to raise awareness among government and the general public on violence against children was produced (see above photo). The materials included billboards and posters, TV and radio spots, a song, and social media materials. T-shirts, tote bags and stickers were also produced and distributed. 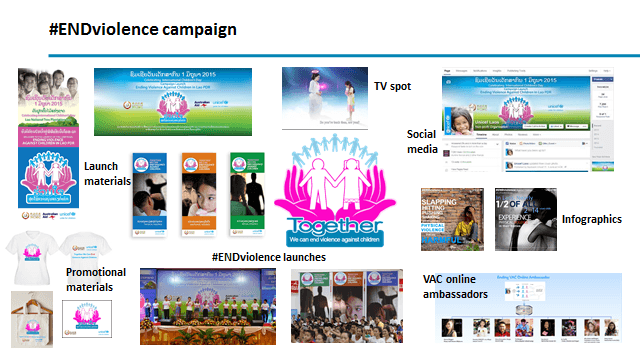 The #ENDViolence campaign was officially launched in Lao PDR on May 31, 2015, at a national event in Vientiane that coincided with International Children’s Day (June 1). On June 2nd, 2016, the preliminary findings of Lao PDR’s first national Violence Against Children Survey report were launched. Both Lao and English versions of the report were posted online. The survey found that violence against children is common in Lao PDR. One in six children had experienced at least one form of physical violence before the age of 18. Roughly a fifth had experienced emotional violence at home, and 1 in 10 experienced some form of sexual abuse as a child. The report reveals that only 15 percent of children ever receive the support they need to recover from their experiences of sexual abuse. These key findings serve as an important step in the nation’s endeavor to find new sets of data on childhood vulnerabilities, data essential for better understanding the prevalence and circumstances of violence against children. They will further inform a range of prevention, early intervention and response initiatives to better protect children in Lao PDR from all forms of violence and will support implementation of the National Plan of Action on the Prevention and Elimination of Violence against Women and Violence against Children 2014-2020. Lao Social Indicator Survey (LSIS) 2011-2012. National Research Council and Institute of Medicine, From neurons to neighborhoods: the science of early childhood development. in Committee on Integrating the Science of Early Childhood Development, Board on Children, Youth, and Families, Commission on Behavioral and Social Sciences and Education. 2000. Washington, DC: National Academy Press. United Nations Secretary-General’s Study on Violence against Children. Felitti, V., et al., The relationship of adult health status to childhood abuse and household dysfunction. American Journal of Preventative Medicine, 1998. 14: p. 245-58. Kendall-Tackett, K., Treating the lifetime health effects of childhood victimization, 2003, Civic Research Institute, Inc: Kingston. Jewkes, R., P. Sen, and C. Garcia-Morena, Sexual Violence, in World Report on Violence and Health, E. Krug, et al., Editors. 2002, World Health Organization: Geneva. p. 147-182. UNICEF Lao PDR. Fact Sheet on Violence against Children in Lao PDR. 2014. Phetviengkhone Sayasane is a 2016 G. Barrie Landry Fellow at the Harvard FXB Center, where she is pursuing a certificate in child protection through the Harvard-UNICEF Child Protection Certificate Program.